Some 6,000 members of the US military have been deployed on the US-Mexican border to keep out the continuing flow of migrants from Central America, especially Honduras. At the same time, the new Mexican President “AMLO” 1, is assuring his military that he will continue to deploy them in the capacity of military police. All this over a comparatively small group of migrants from Central America. 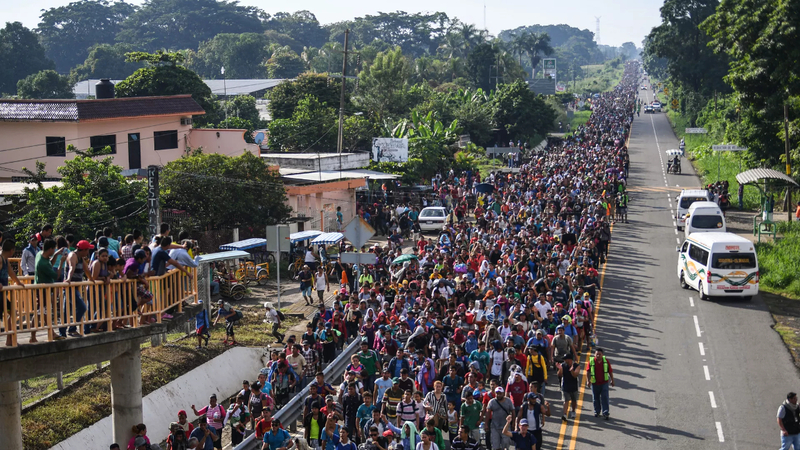 They are fleeing for their lives from a Central America where decades of “anti-communism” bestowed the blessings of democracy in the form of death squads and Washington's "War on Drugs", thus fostering the creation of an intractable gangster narco-bourgeoisie. Indeed the gang problem in Central America today was largely caused by the constant deportation of migrants from the US back to countries in Central America that thus exported US-based gangs to countries like Honduras and El Salvador. Indeed while there is xenophobic sentiment against immigrants, there also exists among American workers a total revulsion at their treatment at the hands of US and Mexican authorities. This creates the basis for class solidarity across capitalism's frontiers and this is the real motive for building walls and borders. With the ousting of former Honduran President Manuel Zelaya2, and the vicious repression that followed came a refugee crisis that bourgeois propagandists hide under the name "migrant". In order to keep the refugees from flowing northwards on the infamous freight train line, "la bestia", the US government under Obama relied more on the Mexican government to patrol the US border on Washington's behalf. The US government has been paying the Mexican government for this service since the days of the Obama administration, some time after the coup in Honduras. The main difference in the situation now is that Trump is doing with the US military what Obama was doing via payoffs to the Mexican government. The massive deportations of the Obama era are the direct precursors to the blatant state repressive violence of the Trump administration. While deploying the US military to "secure" an American border might seem like an unusual measure the general trend in the US for decades has been to clamp down on immigration. Since the crisis of capitalism began to reassert itself in the 1970s the impetus among the bourgeoisie in the US has been to increase legal penalties and punish those migrants who didn't arrive with the proper paperwork. This has the effect of repressing those who already reside in the US. Any migrant worker will hold back from asking for assistance or expressing a political opinion if they are afraid that Immigration and Customs Enforcement agents will come after them. Indeed the increasing intervention of the military in social conflicts from Ferguson3 to the protests at the border represent a true threat to all workers. The current bourgeois imperative to keep the migrants out of fortress America underlines the existing weakness in the US economy that belies the rosy employment narrative of statistical fabulists. The labor market isn't actually "tight". If it was the bourgeoisie wouldn't be nearly as hostile to immigration as they are. The US traditionally has been able to take advantage of the pressure of immigration to suppress wages. Likewise an indigenous working class citizen can always be played off against the migrant workers. The same xenophobic capitalist ideology filters down from the bourgeoisie and its sentiments can be heard around us all the time. Immigration is also important to the bourgeoisie for purposes of political patronage: this is apparent in the Democratic Party of today as it was in the Democratic Party of Boss Tweed's Tammany Hall in 19th Century New York. Immigration policy as it has arisen in the imperialist epoch has helped engineer the ethnic, religious and racial makeup of the American working class. Indeed ethnic groups like the Ukrainian nationalist community, or anti-Castro Cubans often achieve a special status and gain the ears of the capitalists in power. Bourgeois nationalist migrants take higher priority. The big difference in the migrant-refugee crisis on the US-Mexican border today is that capitalism is in an intractable global crisis. A hundred years ago a mostly peasant population was uprooted as migrants who became proletarians upon arriving in the industrialized capitalist metropoles. Today it is primarily proletarians that are uprooted. While the remittances the migrant workers are able to send home end up becoming crucial sources of capital flowing back to the migrant workers' states of origin. The brutality towards migrant workers is unanimously supported across the whole spectrum of bourgeois political power. There is no serious constituency among the ruling parties to maintain a larger "reserve army" of labor internally than already exists. This political reaction made manifest in the use of the military repressive forces of the state says as much about the insecurities of capitalist power as it says about the crises that that have produced these migrant workers. In a world that will one day belong to the proletariat there is no place where workers are welcome. A true communist society wouldn't be uprooting people over decades of imperialist robbery and violence. In a global society where all real needs are properly catered for there would be no desperate need to move but there would also be no restriction on free movement anywhere. States, frontiers and passports would be confined to archives and museums.